My old Okrasa heads have now arrived from Danne in Västmanland, Sweden. He did do a valve job and a touch up of the mating surfaces for the cylinders. Aside from new valves, that were the only things needed to get the heads in good shape. The exhaust valves became an interesting story. At first it seemed easy. The dimensions are the same as for the stock 30/36 hp valves. My first thought was to use stock valves. But, the exhaust valves were a source of trouble already on stock engines at the time, so a performance engine would require something better. Next attempt was to take a glance at modern replacement valves. BBT in Belgium claimed that they had valves in a better material, but couldn't specify it more precisely. Finally I got them to at least try if they were magnetic to get some more information. They came back and said they were not. This means they are of an austenitic stainless steel, rather than a martensitic. Thus I assume they are of a quality described by IVAM as a: "steel widely used for high performance inlet and exhaust valves". Much better! So, once again a package of valves got to travel from Belgium to Up North and then back to mid/southern parts of Sweden. 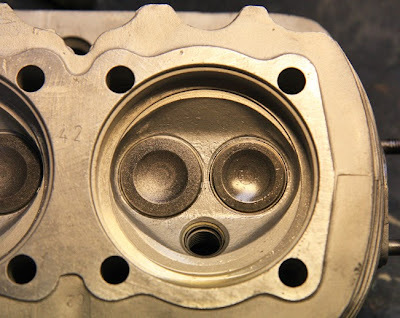 For me BBT was the easiest option, but the valves for Wolfsburg Wests repro Okrasa heads are also made from a good austenitic stainless steel. Check with a magnet to be on the safe side, it's easy also for the vendors to mix them with standard valves.